A beautiful connection of movement and breaths focusing on proper movement and alignment. Melt away stress and create space for strength and flexibility. Combines Yoga, Pilates, and classical ballet barre work to build strength, power, and flexibility. Use light weights, body weight, and props for balance to build core strength and target your entire body. Whether you're looking to improve your strength and balance or are an athlete interested in increasing your power and strengthening your posterior chain, this class is for you. BODYPUMP™ is a barbell class that will sculpt, tone and strengthen your entire body! BODYPUMP™ is one of the fastest ways to get in shape as it challenges all of your major muscle groups while you squat, press, lift and curl. * BODYPUMP™ Breakdown is perfect for anyone new to class or who wants to perfect their technique. Bootcamp is a combination of strength, cardio, muscle endurance, flexibility, core and functional movements. A variety of equipment and body weight exercises will be used to complete each workout. This is a user friendly workout, modifications will be provided. A cardio workout that includes variety of punches, kicks, knees, elbows and calisthenics for the first 40 minutes of class followed by 20 minutes of core and stretching. Don't be afraid to mix it up and blast through your plateaus. Try kickboxing, 80's night, step up fun, cardio circuits, & more. High intensity, low impact workout utilizing stationary bikes. Improve strength and cardiovascular conditioning while cycling to motivating music. *Simply Cycling is for a new cyclist to get properly fitted to the bike and get introduced to the Coach by Color system. *HIIT Cycling incorporates high intensity interval training with more intense workout options! Which format with your instructor choose? Show up and be surprised or check the APP/website. TRX®, BODYPUMP™, Cycling: anything goes! Guaranteed to wake you up! This 30 minute express class will offer cardio, strength, and core training in 10 minute segments designed to help you get the most out of your workout and in the least amount of time. A perfect combo before your busy day. A unique and fun approach to fitness by using a stability ball to increase your heart rate, improve balance and shape your body. Qigong is like moving meditation. We do slow and gentle movements, focus on breathing mor slowly and fully and we allow our mind to become quiet. Can be done sitting or standing. Some of the health benefits participants have experienced are: feeling less stressed, blood pressure normalizes, pain reduction and a more positive outlook on life. An open formatted class that emphasizes exploration of both the familiar and the new. Class includes a slower flow practice to allow you to get familiar with each pose, hold postures and release muscle tension, as well as the opportunity to challenge you in both basic and intermediate asanas with a lengthy relaxation. Increase muscular strength, range of movement, and activity for daily living skills using hand-held weights, elastic tubing, and balls. A chair is used for seated and/or standing support. Move your whole body through a complete series of seated and standing Yoga poses (no floor exercises). Chair support is offered to safely perform postures designed to increase flexibility, balance, and range of movement. Restorative breathing exercises and a final relaxation will help promote stress reduction. Suitable for beginners looking to improve balance and increase strength in an easy to follow format. Chairs will be used for the majority of the class. Incorporate the most functional fitness pieces of equipment into one class. Get the benefits of the TRX® Suspension Trainer® as well as the explosive exercises that can be performed with or without equipment. Link standing poses through Sun Salutations followed by hip openers and spinal twists. Suitable for beginners and experienced practitioners looking for a well-rounded practice that includes both strength and flexibility. A fiercely fun dance fitness workout class based on pop, rock, and hip-hop music taught by Certified Fitness Professionals. The signature WERQ™ warm up previews the dance steps used in class and the signature WERQ™ cooldown includes balance and yoga inspired poses. Are you ready to WERQ™? This class combines Vinyasa Flow with Restorative Yoga. Expect long deep stretches and Yin postures that work on opening connective tissue and deeply stored tension in the body. Excellent for beginners and for athletes looking for a calming, deep stretch followed by a lengthy relaxation. ZUMBA® is a fusion of Latin, hip hop, and international music dance themes that create a dynamic, exciting, effective fitness system! It is a mixture of body sculpting movements with easy to follow dance steps. Zumba® Gold is a fitness program specifically designed for the active older adult, the beginner participant, and other special populations that may need modifications in an exercise program. Designed for those who want a moderate to vigorous workout. This class includes a variety of cardiovascular and strengthening exercises that will keep your heart rate up and build strength. Noodles, water dumbbells and webbed gloves are used to create your choice of resistance in this interval style class held in the Lap Pool. This class combines breathing techniques with gentle movement patterns to help increase balance, strength and range of motion. Relax and benefit from the meditative and soothing movement in the comfort of our Warm Water pool! Tone and sculpt your body with minimal impact to your joints. This water workout is a blend of cardio, strength, and stretching exercises that incorporates resistance tools such as buoyant water dumb bells, kickboards and noodles. 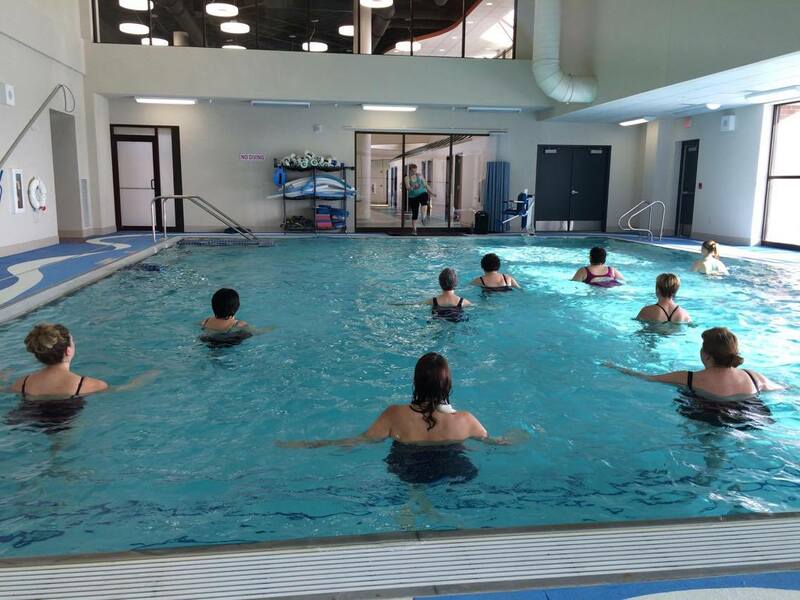 This class is designed for anyone looking to gently get their heart rate up, tone their muscles and stretch in the pool. To contact La Vita, email LaVita@DSHealthcare.com or call 608-745-3800.